Sam is a Professional Boxer and is the current British Heavyweight Champion. Sam teaches 1-2-1 boxing fitness and technique as well as group boxing fitness classes under S.A.S. Boxing. 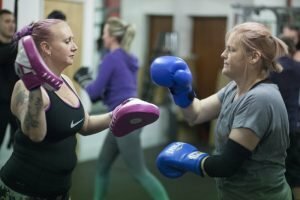 Sam’s sessions incorporate different elements of boxing fitness, technique and conditioning depending on what it is that you need and want to focus on to improve. 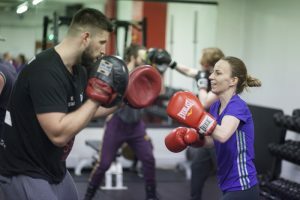 Sam Sexton Boxing Fitness classes can take a variety of formats, but a typical one may involve shadow-boxing, skipping, hitting pads, press-ups, shuttle-runs and sit-ups etc. These classes are aimed at men and women of all ages and fitness standards. As no session involves the physical hitting of an opponent, it is a fun, and challenging and is a safe workout. Whether you want to try something different that is fun and high energy to lose weight or jazz up your fitness routine. 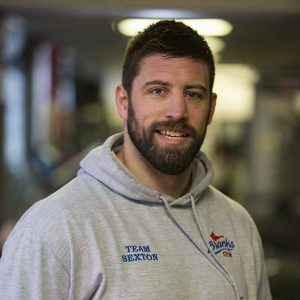 Boxercise sessions with Sam are very well personalised to suit your level of knowledge and experience. Complete the form below or call 07857 420113 to arrange your free no-obligation chat to find out what Personal Training can do for you.